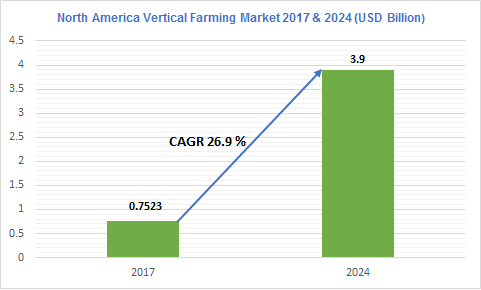 Graphical Research presents a most up-to-date report on “North America Vertical Farming Market analysis based on Product, Technology, Application, Industry Analysis Report, Regional Outlook, Growth Potential, Competitive Market Share & Forecast, 2018 – 2024”, estimated to exceed USD 3.9 billion by 2024. Hydroponic technology is likely to hold a share of about 50% of the total North America vertical farming market by 2024 and the requirement of less space and soil as compared to other conventional cultivation processes will propel the segment’s industry growth. Aquaponics is a technology of aquaculture in which they use the waste produced by fish as a manure for the plants instead of chemical nutrients. Vertical farming market has two major applications out of which indoor application accounts for a substantial portion.